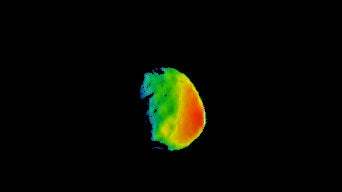 The Thermal Emission Imaging System (THEMIS) camera on NASA's Mars Odyssey orbiter observed Phobos on Sept. 29. THEMIS Principal Investigator Philip Christensen and THEMIS Mission Planner Jonathon Hill of ASU’s School of Earth and Space Exploration combined visible-wavelength and infrared data to produce an image color-coded for surface temperatures of this moon, which has been considered for a potential future human-mission outpost. "Including a predawn area in the observation is useful because all the heating from the previous day's sunshine has reached its minimum there," said THEMIS Deputy Principal Investigator Victoria Hamilton of the Southwest Research Institute. "As you go from predawn area to morning area you get to watch the heating behavior. If it heats up very quickly, it's likely not very rocky but dusty instead." In normal operating mode, Odyssey keeps the THEMIS camera pointed straight down as the spacecraft orbits Mars. In 2014, the spacecraft team at Lockheed Martin Space Systems in Denver, NASA's Jet Propulsion Laboratory in Pasadena, California, and the THEMIS team at ASU developed procedures to rotate the spacecraft for upward-looking imaging of Comet Siding Spring as it passed near Mars. The teams have adapted those procedures for imaging the Martian moons.